I forgot to bring my camera along, so all I had was my lousy cell phone to capture a few images. 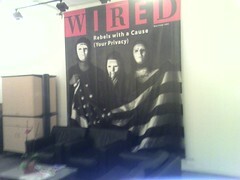 But the tour of Wired’s Magazine and News offices was definitely one of the highlights (I'll blog another later) from my short trip to SF -- along with having dinner with a good friend. Thanks Bev!